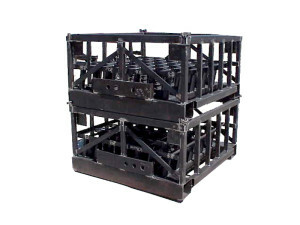 As a specialty niche, we are a recognized designer and fabricator of baskets and fixturing for solution heat treatment and age hardening of aluminum automotive parts. We have been involved in producing successive generations of fixturing for numerous manufacturers for the heat treatment of engine blocks and heads, wheels, suspension components and other related items. 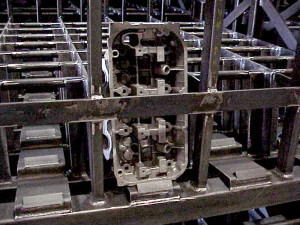 In this case, engine blocks, our task was to design a basket for use in a continuous feed, robotically loaded and unloaded furnace line. 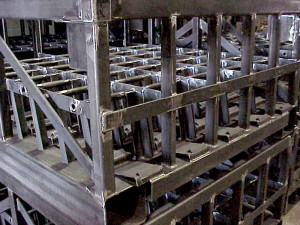 Considerations included: minimizing basket weight, optimizing load to fixture weight, parts orientation and positioning to facilitate robotic loading / unloading, minimizing distortion both from heat and quench, insuring smooth travel over rollers in furnace.